In celebration of her birthday, I have joined Sidetracked Mom and several other amazing bloggers to bring YOU a birthday surprise! Together, we’ve purchased “a few of our favorite things” and are passing them along to you as a THANK YOU for visiting and interacting with us on our blogs, Facebook, Twitter, etc.We really appreciate you! One lucky winner will receive this brand new COACH wristlet! 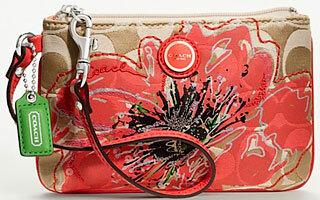 This wristlet is NEW from the 2012 Poppy Signature Collection – as the winner, you’ll be one of the first to own one! Our popular small wristlet in signature jacquard, updated with a vivid, sequin-embellished bloom, delicate embroidery, bright, hand-finished trim and a color-matched enamel medallion. And, while you may already be excited about that, when you receive the wristlet, you’ll want to check inside! We’ve tucked in THREE gift cards to a few of our favorite places as well! We want you to go shopping and have fun while looking absolutely adorable with your brand new Poppy Signature Flower Coach wristlet! All you have to do is enter by completing the tasks in the Rafflecopter Entry Form LINKED below! You can complete as many or as few as you’d like but, remember, the more you do, the more entries you gain and the more likely it is that YOU will be our winner! So, bookmark the page linked and go back every day to complete the available daily entries if you *really* want to win! Thanks to these bloggers for helping to make this giveaway possible!